"Without enzymes, life itself would not be possible; a lack of enzymes, in fact, leads to chronic, degenerative disease and premature aging." We cannot get our essentials from our food supply; the only solution is a raw foods diet and an enzyme supplement." Dr. Edward Howell, renowned author of " Food Enzymes for Health and Longevity" and " Enzyme Nutrition". Global Health Trax Active Digestive Enzymes represents a powerful step toward achieving high levels of health and wellness! Enzyme nutrition points out that each one of us is given a limited supply of bodily enzyme energy at birth. This supply has to last a lifetime. The faster you use up your enzyme supply, the shorter your life. A great deal of our enzyme energy is wasted haphazardly throughout life. Most people spend their enzyme bank account but seldom make a deposit. To prevent enzyme loss from shortening the life span, we have only one solution - we must provide enzyme reinforcements from the outside to cut down the secretion of digestive enzymes to allow the body to make enough metabolic enzymes for our immune protection. The over processing and cooking of our food and the over fertilization and pesticide spraying of our soils and farmlands have virtually destroyed natural living enzymes in the food we eat. Enzymes are substances that make life possible. They are needed for every chemical reaction that takes place in the human body. No mineral, vitamin, or hormone can do any work without enzymes. Enzymes are needed for our body to build proteins, carbohydrates, and fats. Our breathing, sleeping, eating, working, and even thinking are enzyme dependent. The living body is under a great daily burden to produce the volume of enzymes necessary to run efficiently. After searching the world over for the highest quality enzymes, Global Health Trax found an unsurpassed source in India with a superior global manufacturer who has been in the enzyme business for over 30 years. The Rothi family has been a leader in the market for both research and technology, developing both digestive enzymes and systemic enzymes. The special formulations that they created with Global Health Trax, are superior. With plant enzyme-rich nutrients included in each capsule, they offer the perfect balance of a FULL-SPECTRUM enzyme support product. Active Digestive Enzymes delivers you Carbohydrase- this enzyme is needed to breakdown carbohydrates of all types. Active Digestive Enzymes also contains Lipase- which aids the breakdown unwanted fats/oils in the body. Active Digestive Enzymes supports you with Cellulase -- cellulase gives you the one enzyme the body cannot produce -- assistance with fiber. Active Digestive Enzymes also offers you a proprietary blend of essential amino acids that help assist all the other "macro" enzymes. 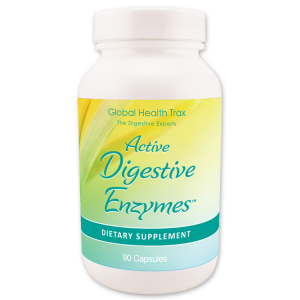 Active Digestive Enzymes also provides a probiotic blend of ingredients that further support your digestive tract. Replenish your enzyme bank account with Active Digestive Enzymes! Adults: Take at least one Active Digestive Enzymes capsule before each meal.